Xiaomi is now rolling out the official MIUI 10 Global Stable ROM for several Android phones. MIUI 10 was announced earlier this year. It quickly became popular because of the revamped user interface, added new features, new launcher, stock apps, and not to forget the MIUI swipe gestures that come with it. MIUI 10 is based on Android Oreo and here we have the latest Global Stable ROM available for download. The ROM has latest features and goodies from Android 8.0/8.1 Oreo. While some flagship phones such as Mi 8, Mi Redmi Note 5 Pro are getting Android 8.1 Oreo firmware update, rest of the devices like Mi 6, Mi Mix 2, Note 2, etc are receiving MIUI 10 based on Android 8.0. The Global Stable version of MIUI 10 is now here for Xiaomi Mi 8, Redmi Note 5 Pro, Mi 5, Mi 6, Mi Mix, and more. As this is global ROM, you get to enjoy the Google Play Services, Play Store, and all the Google apps that come with it. Earlier, we have also listed MIUI 10 based on Android 9.0 Pie for some Xiaomi Mi 8 and other devices. You can directly flash the OTA update manually via recovery mode, or the easy installation method listed below. Alternatively, you can flash the firmware via custom TWRP recovery as well. But you will need to Unlock Bootloader on your phone. 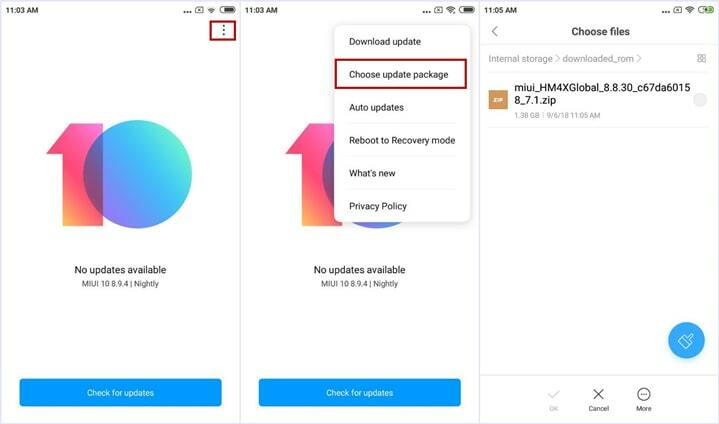 How to Update Xiaomi Phones to MIUI 10 Global Stable ROM? Download the latest MIUI ROM from above. Transfer the ROM file to phone storage. Put it into the folder ‘downloaded_rom’ in the internal storage of your device. Launch ‘Settings’ app on Xiaomi phone. Go to About phone > System update > press three dots icon at the top-right corner. Select ‘choose update package’ to enter. Choose the ROM file you’ve put in ‘downloaded_rom’ in step 2. Once selected, your device will begin upgrading. Enjoy MIUI 10 on your Xiaomi devices.